This desktop was made by me of course and in association with RedNeckDude Creations. Thankyou for all your help and advice. This skin was made in tribute to Leonard Nimoy AKA (Mr.Spock) who passed away about a month ago. I have seen screensavers, game tributes, wallpapers etc. and with this skin I want to do my part in memory for Mr. Spock. 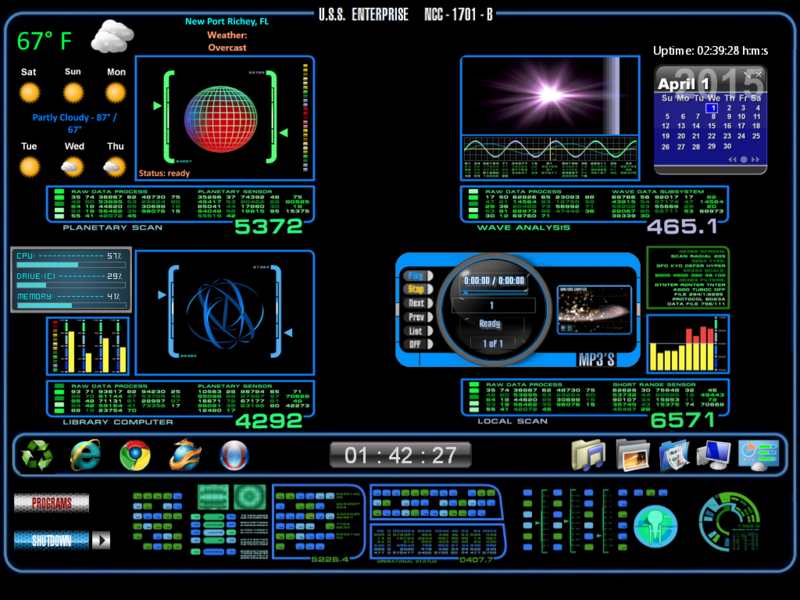 This desktop is working science station and has the exact animations you would find on the science console. there is a set of instructions with this skin but really self explaining I gave this console a little twist to it with weather and calendar widgets which where made by RedNeckDude and the other widgets which are old in way but still really good looking and working really well. Also there is docking bar on the bottom and I gave most browser icons and you take your pick which one you want to use just change the target also theres a shutdown menu so you can use this skin with taskbar or without. The mp3 player is self explaining but old as well but fits this skin perfect. if you don't use it its ok just leave the play button on and keep the animation going it looks great. Theres not much more about this skin except I named it LLAP for short for LIVE LONG AND PROSPER. Damn! The two of you did fantastic work...seriously fantastic. I don't use DX but I think a Master Skinner like Jim could certainly turn this into a blind and a Winstep if (with your permission) he wanted...and I think Leonard Nimoy deserves that tribute for the person he was and the hours of enjoyment and speculation he gave us all. This was probably a lot of work and with good intentions, but what is with the 1032x740 size? It is useless on my 1920x1080 screen! DrJBHL I really really want to thankyou for the great comment and it was good to make this and i am not sure how to do a blind but if i could i would and will consider it again thankyou so very much. I didn't actually do anything other than advise. Looks like you did good, cghaveman!! Well, you can. Good impression. One of the problems with using/making a theme that is attached to a background is that the background should resize itself to fit the screen it's used on. This can be done several ways. The first would be to set the background as a wallpaper (not an object) and set DX to resize it. Then, you leave the objects unlocked so the end user can move them easily into preferred position. Or you set the width and height of the background object to 100%. Meaning it will resize itself to fit the screen. In this skin, either would be problematic due to stretching the text on the background object. If that text had been a graphical object, this stretching wouldn't occur.